What hit me like a brick after starting to read, “The Millionaire Next Door,” is that perhaps my way of thinking is why I am not farther ahead in terms of my net worth and financial well-being. I have heard and read repeatedly that when you dream, you have to dream big. Dreaming big often means dreaming of being a millionaire. Well, in my mind, I could never dream that because I didn’t want that life. I don’t want the fancy cars or the homes so big that you do not even use every room. I just wanted (and still do) a simpler life and I always felt that large amounts of money brought trouble. So what I have done is dream small, so to speak, and perhaps that has hindered my progress on a subconscious level. The book gives a great example of a Texan that sticks out in my mind. At first glance, no one would think he was a millionaire. The material possessions in his life did not follow the “traditional” millionaire items. No fancy suits, no fancy watches, no fancy house, etc. If I could be a millionaire – that’s the type I would want to be right there. And I realized it is possible be a millionaire and live the life I want. I have been trying to say to myself, “I will be a millionaire” and I still cannot say it. But I am working on it. I have a feeling once I can say it and truly mean it, then I will be open to more possibilities in my life. It’s funny because this is supposed to be about my journey to become debt-free. 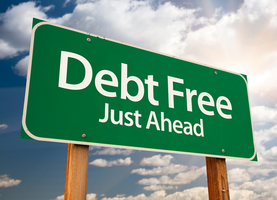 But I now realize that becoming debt-free can only be achieved by undertaking another journey – the journey for personal growth. That certainly gets at the difference between the connation of millionaire, and the denotation. What you want is to have a $1 million dollars to your name. You don’t want to be a “millionaire”. It’s choosing to save versus spend. I think it’s great that the book has helped you look at that. Keep up the good work! I am also working on getting out of debt and, although it is a long and hard road, when you start seeing some progress it feels great! Nice post. It’s true. Once you understand how millionaires think and make choices to spend their money or not, you’ll start taking the steps towards enriching your net worth. You are already thinking like a millionaire by realizing you need to keep your money rather than spend it. Kudos to you for what you are doing. When you get that debt paid off, you can start putting that monthly nut to investing in retirement. I’ve been where you are, and it is possible to get out of debt. Better yet, once you’re out, it is easy to stay out if you plan properly. I got into debt when I lost my business, I tell my story on my blog at http://debtandcredit2.blogspot.com and have been blogging about potential solutions, along with some ranting and raving about the traps set by banks and credit card companies. We’re in this together. Keep up the good work!